While Azerbaijan grows rich from energy extracted from beneath the land and sea, quacks and charlatans in the Caspian Basin nation are making hay. In a national survey conducted earlier this year by the Baku-based Center for Economic and Social Development, an internationally recognized independent think-tank, roughly a quarter of the 500 respondents said that they had visited a psychic, shaman, fortuneteller or astrologer in 2012. Based on respondents’ information, the Center estimated that a whopping 160 million manats, or about $203 million, had been spent on such services. The amount stands out, considering that Azerbaijan has a population of roughly 9.6 million. “It is three times more than annual government budget spending on maintenance of the presidential administration or four times more than spending on the judiciary system,” claimed the Center’s director, economist Vugar Bayramov. Throughout the South Caucasus, as well as in nearby Russia, Iran and Turkey, fortunetelling long has prospered, no matter what the government’s attitude or religious restrictions. But increased income levels over the past decade in Azerbaijan seem to have provided a big boost to such practices, Bayramov believes. According to government data, the average income in Azerbaijan has increased by 2.9 times since 2003 and now stands at 517.6 manats ($659.70) per month. “People have more savings to spend for psychics’ services. Meanwhile, lots of social-welfare problems make people [lack confidence] about the future,” Bayramov commented. Low trust in the state-run healthcare system, for instance, prompts “more people to ask various healers for recovery” from their medical problems, he said. Other widespread problems, such as unemployment (the official rate stands at 5.1 percent, but unofficial estimates go into the teens) or low levels of education, also play a role. Prices are negotiable, depending on the psychic’s reputation and the client’s own financial status and the “scope of work” requested, Kenan M. continued. A single visit to an ordinary Azerbaijani psychic could range anywhere from 50 to 1,000 manats ( about $64 to $1,275). A session with a celebrity Azerbaijani psychic, such as Moscow-based para-psychologist Zireddin Rzayev, can climb as high as 10,000 manats ($12,700), according to popular report. As newspaper ads attest, hexes against rivals, known as jaadu, are one service particularly in demand in this market. Most clients, Kenan M. estimated, are, indeed, women, between the ages of 18 and 32, who come seeking love, marriage (an event strongly encouraged for women throughout the Caucasus) or “to open their chakras,” the Hindu concept of life-giving energy. While rumor has it that senior members of the Azerbaijani government and their family members also make regular use of fortunetellers, the reports cannot be substantiated. “There are psychics who provide services to the elite, but they are low-profile and not many people know about them,” commented Kenan M.
Being circumspect about any interest in psychics is not limited to the elite alone. Several secular-oriented young women shared detailed knowledge about various Baku psychics’ names, services and prices with EurasiaNet.org, but denied ever having visited one. 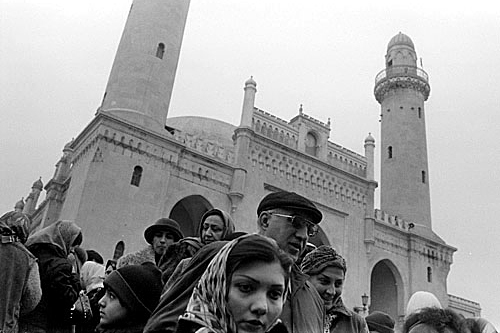 Practicing Azerbaijani Muslims generally abstain altogether from fortunetelling, which the Koran defines as a sin. Shahin Hasanly, a popular imam at Baku’s Meshadi Dadash mosque, commented that he has not even addressed the issue with believers since fortunetelling’s status as “a big sin” is clear. The Center for Economic and Social Development’s study results “show how large are the moral problems in our society these days,” he added. One psychologist working at the Baku-based Women’s Crisis Center, a non-governmental organization, argues, though, that trips to fortunetellers are nothing unusual and will continue so long as problems exist to be overcome.